Amos Guiora next to his book, "The Crime of Complicity." If you are a bystander and witness a crime, should intervention to prevent that crime be a legal obligation? Or is moral responsibility enough? 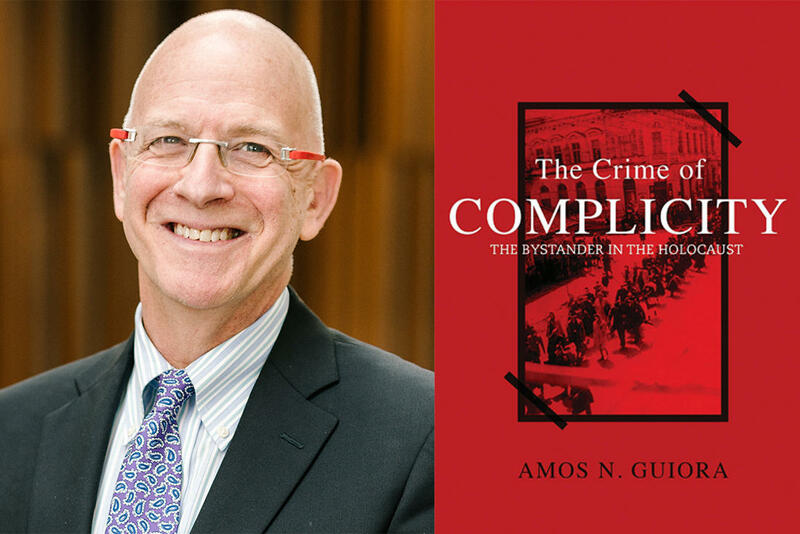 Amos N. Guiora addresses these profound questions and the bystander-victim relationship from a deeply personal and legal perspective, focusing on the Holocaust and then exploring cases in contemporary society. He shares the experiences of his parents and grandparents during the Holocaust and examines sexual assault cases at Vanderbilt and Stanford and other crimes where bystanders chose not to intervene. Guiora recommends that we must make the obligation to intervene the law, and thus non-intervention a crime. Amos Guiora on Access Utah. Amos N. Guiora is Professor of Law at the S.J. Quinney College of Law, the University of Utah and Lieutenant Colonel (Ret.) in the Israel Defense Forces. He is actively involved in bystander legislation efforts in Utah and in other states around the country. Guiora has an A.B. in history from Kenyon College, a J.D. from Case Western Reserve University School of Law, and a Ph.D from Leiden University. Guiora has published extensively both in the United States and Europe on issues related to national security, limits of interrogation, religion and terrorism, the limits of power, multiculturalism and human rights. He is the author of several books, including Freedom from Religion: Rights and National Security (2009), Tolerating Intolerance: The Price of Protecting Extremism (2014), The Crime of Complicity: The Bystander in the Holocaust, and most recently Earl Warren, Ernesto Miranda and Terrorism (2018). Dr. Anne Spoerry treated hundreds of thousands of people across rural Kenya over the span of fifty years. A member of the renowned Flying Doctors Service, the French-born Spoerry learned how to fly a plane at the age of forty-five and earned herself the cherished nickname, "Mama Daktari"--"Mother Doctor"--from the people of Kenya. Yet few knew what drove her from post-World War II Europe to Africa. Now, in the first comprehensive account of her life, Dr.
Walter Link and Miriam Wollaeger, a young geologist couple in 1920s Wisconsin, set out to find oil to supply the surging U.S. demand. This exciting work will allow them to build their lives in South and Central America, Indonesia, and Cuba. But from the first posting in Columbia, they quickly discover that no women are working in the field in these places. While Walter faces the hardships and thrills of exploration in the jungles and mountains, and eventually becomes chief geologist for Standard Oil, Miriam is left behind in the colonial capitals during Walter’s often lengthy times away. On the morning of April 29, 1986, a fire alarm sounded in the Los Angeles Public Library. As the moments passed, the patrons and staff who had been cleared out of the building realized this was not the usual fire alarm. As one fireman recounted, “Once that first stack got going, it was ‘Goodbye, Charlie.’” The fire was disastrous: it reached 2000 degrees and burned for more than seven hours. By the time it was extinguished, it had consumed four hundred thousand books and damaged seven hundred thousand more. Utah Valley University professor Susan Madsen has been focusing for several years now on helping more women graduate from college and helping more girls and women in Utah become leaders in their organizations and communities. She is the founder and director of the Utah Women & Leadership Project at UVU. Today on Access Utah: As the federal government shutdown continues with no end in sight, we talk about its effects in Utah. We look at effects on government employees and how the shutdown is affecting Utah’s national parks, among other topics. And we want to hear from you. Is the shutdown affecting you? What do you think should be done? Continue the conversation at upraccess@gmail.com.